5 Mistakes Authors Make – Here’s What To Avoid! TBT to Tara Richter, President of Richter Publishing, discussing 5 Mistakes New Authors Make on iHeart Radio with Brandon Rimes on The Real Estate Quarterback Show. Richter Publishing wants to know how we can help you take your manuscript to the next level and get you published! If you have already written a manuscript, please fill out this form so we can get to know more about you and your book! We do not work with literary agents. Authors are our number one priority and we work directly with you. If your book fits into our scope of work, you will be contacted to submit your manuscript for review. This form covers the purpose of your book, the services you’re interested in and your budget. Leave your legacy – Start today! Comments Off on 5 Mistakes Authors Make – Here’s What To Avoid! On-the-Go this Holiday Season but Still Need to Finish Your Book? Check out these tips! Inspiration strikes at the most random times – Don’t let it pass! You might not always have a piece of paper and pen handy, but your smart phone is either in your hand, back pocket or purse at all times. USE IT! I composed my second and third books in small chunks writing everywhere you could imagine. I used the notepad app on my iPhone. I even bought a fifty dollar Bluetooth keyboard so I can easily sit and write when I’m inspired. Once I’m done with my thoughts I email it to myself so when I get home, it’s waiting in my inbox. Then I copy and paste it into a Word document and clean it up. Anytime you gave a extra five minutes in your day, you need to write. Waiting in line to pick up the kids from school? Write on your smart phone or tablet. Walking on the treadmill? Jot some ideas down. I get some of my best ideas wiggle working out, probably because of all the blood pumping through my veins and those feel-good endorphins flooding my body. Traveling soon? Airports are another great place to write. Just think about how many minutes you waste lining up to be groped by security, waiting for delayed flights, or sitting on the plane while the staff fuels up, thinking, Damn where is that truck to push back the plane? Never take a second of free time for granted! Create in the chaos and leave your legacy! Comments Off on On-the-Go this Holiday Season but Still Need to Finish Your Book? Check out these tips! How to Write A Book in 4 Weeks! To get your copy of “Write a Book in 4 Weeks!” click here! Comments Off on How to Write A Book in 4 Weeks! When things feel like they aren’t going your way, or tragedy strikes and you don’t know how to go on, sometimes you just need to lose yourself in a good read that is about a woman who constantly perseveres when she is faced with controversy. In The Little Amazonian, Miroslava Espinosa tells us a modern-day survival story that will amaze. Told through her memories, she relates stories of close encounters with wild animals, struggle for education, food, and money, and a myriad of health issues. Through it all, she emerges a strong woman who faces all odds with renewed determination. 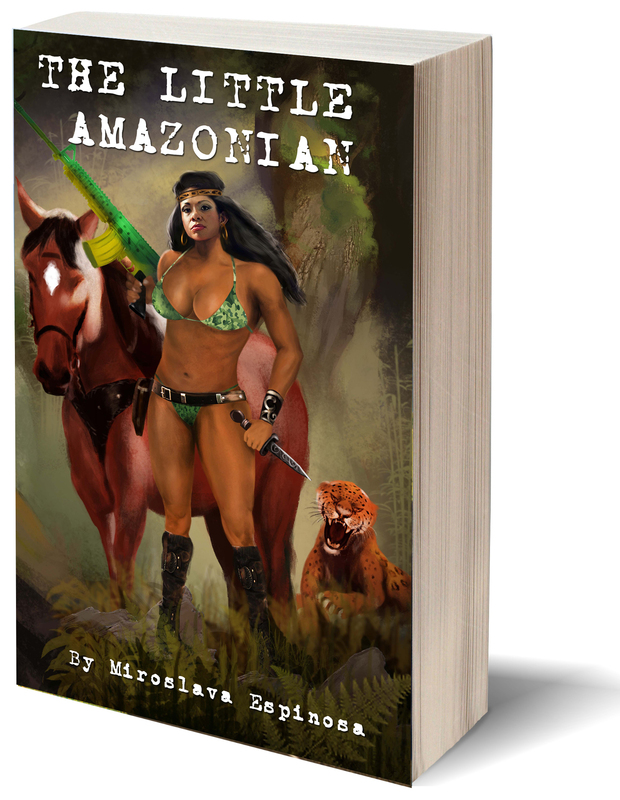 “The Little Amazonian” By Miroslava Espinosa – Get it on Amazon Today!! Tips on How to use LinkedIn to Promote Your Book! While using Instagram, Twitter and a blog is extremely helpful in promoting your new book or series – some people often forget about LinkedIn! If your title is leaning more toward the professional side, maybe geared toward working mothers, entrepreneurs or businessmen and women, it may be time to dive into promoting it on LinkedIn! If your book is listed on Amazon, use the “Reading List” by Amazon to highlight it in your Profile. Encourage your friends to list your book in their Amazon Reading List with positive comments. Add your book to your “Professional Headline” section. Utilize every outlet to your advantage. Be smart. And be proactive. Comments Off on Tips on How to use LinkedIn to Promote Your Book! FREE Resources to help you become a Published Author! If you were to visit Richter Publishing’s website and click on Resources you would find a plethora of free resources available to help you outline, plan, and even format your book! Don’t make leaving your legacy harder than it has to be! Jump on our site, grab our FREE resources and book a FREE consultation! Comments Off on FREE Resources to help you become a Published Author! Life Hack to Finish Your Book FAST! Write 715 words per day. You would be surprised at how incredible strides are made with just 715 words per day! It really adds up and slowly, writing becomes easier! Comments Off on Life Hack to Finish Your Book FAST! Boost Your Book Sales with these Instagram Tips! Being present on social media is imperative in today’s society when trying to promote your book! This course will give you the knowledge it takes to optimize your photos for search engines and also the “Do’s and Don’ts” of Instagram. Instructor and author, Pierce Brunson, takes you step-by-step through the process of organizing your photos, SEO, and the proper use of hashtags. The course is made up of video and also comes with a supplemental PDF to guide you through the presentation. Grab your tablet or smartphone and get ready to get some Instagram followers for you or your business! This course is for entrepreneurs, small business owners—and anyone who is trying to learn how to operate Instagram! Richter Publishing wants to set you up for success, so we’ve made this course completely FREE! Click here to get your session started! Comments Off on Boost Your Book Sales with these Instagram Tips! What would you do if you suddenly found everything you knew was taken away from you? What if in the blink of an eye, you no longer were able to speak, walk, work, or dress yourself? What would you do if you could not even tell your children that you loved them? For Debbie Killebrew, these horrible questions came true in one night of drinking that changed her life forever. However, Debbie has fought to overcome the impossible, even when she was told that she would never walk again, never drive again, and never live a normal life again. Her inspiring true story will show you that no matter what twists and turns life takes, you can get up and keep going – and also serves as an unfortunately realistic testimony about how drinking and driving can truly take away everything you know. Get your copy of “Finding My Way Back” here!